Odorant-receptor interactions constitute a key step in the olfactory detection of chemical compounds. Various studies support the combinatorial coding of olfaction, in which each odorant activates an array of odorant receptors and each odorant receptor is capable of recognizing multiple odorants, while large-scale studies involving numerous odorants and odorant receptors help to resolve the tuning specificities of receptor repertoires. 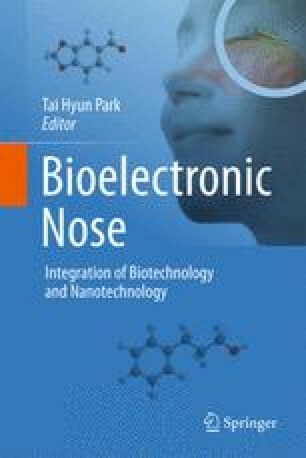 In the meantime, the proteinaceous content of the nasal mucus, including odorant binding proteins and different types of xenobiotic-metabolizing enzymes, also contributes to odorant receptor activation by transporting, concentrating, converting, and/or ultimately removing odorants from nasal mucosa. In addition, the presence of metal ions, notably copper ions, is known to be important for the activation of odorant receptors for certain types of metal-coordinating odorants. Finally, prediction algorithms based on odorant properties and receptor structures are becoming increasingly feasible for investigating detailed mechanisms involved in odorant-receptor interactions. We are indebted to Dr. Tai Hyun Park for the invitation to contribute to the book. Our work described here is supported by grants from National Institutes of Health (to H.M.), Chinese National Natural Science Foundation, the National Basic Research Program of China’s 973 Program, Shanghai Municipal Education Commission, Shanghai Education Development Foundation, the Science and Technology Commission of Shanghai (all to H.Z. ), and Shanghai Jiaotong University School of Medicine (to X.S. ).